Imagine a bride and groom walking down sun-drenched beaches lined with graceful palms. The bride to be standing on the beach overlooking fiery sunsets giving way to moon lit walks along the ocean. A beautiful wedding set amongst tropical gardens and romantic fountain courtyards. 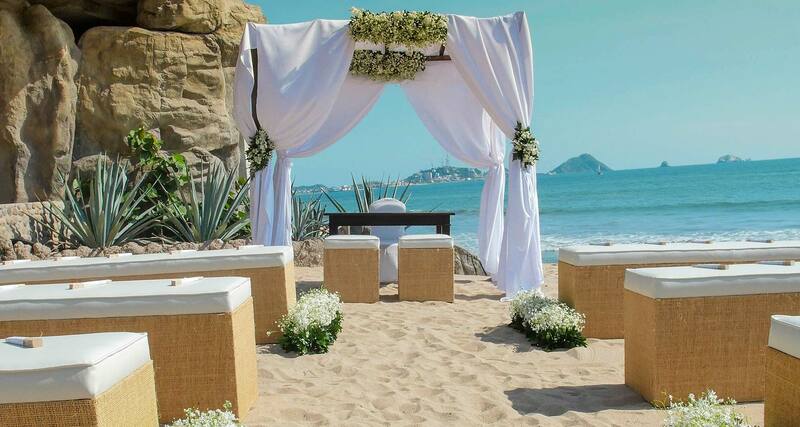 Hotel Playa Mazatlan, our beautiful resort on the beach has been hosting unforgettable weddings for 55 years. Our staff and on site wedding planner will help the bride to be and family, plan your entire celebration; including menus, cakes and floral arrangements, personalized photography of the bride and groom as well as wedding parties, guest transportation and accommodations ranging from beautiful ocean front rooms to deluxe ocean front suites. 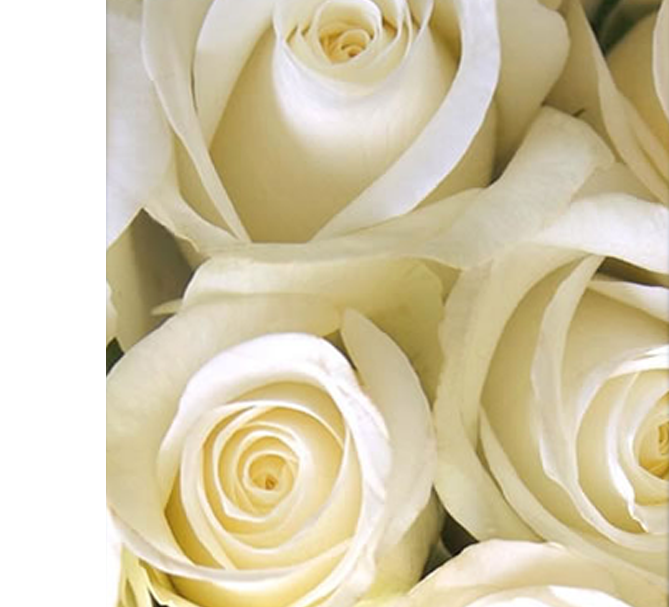 As an added service we provide access to a complimentary translator during the planning and the official speech at your wedding ceremony. Choose from inspiring locations: on the beach, pools, gardens, or in a resplendent reception hall; let our wedding planner help the bride to be design a wedding that is a match with her lifelong dreams. Whether the wedding day you are planning is intimate or grand scale, festive or formal, traditional or fun… the bride and groom to be, are sure to find a match that will celebrate this wedding day in an environment that will provide a luxurious experience, all the comforts of home, the grandeur of an ocean front wedding and the warmth of a happy families embrace. 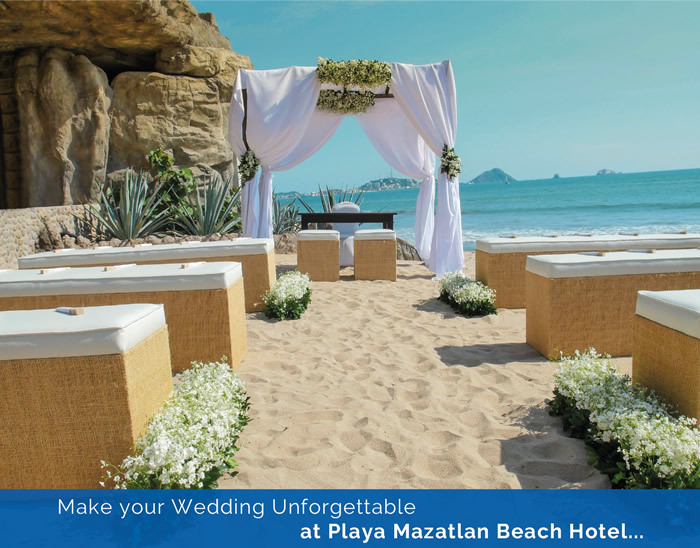 Call today and let the Hotel Playa Mazatlan provide the bride and groom with the event they’ve always dreamt of. * Side French Fries (menu for children under 12). Are the groom and bride to-be checking in as “Mr. and Mrs.” For the very first time? This is just the beginning of your fabulous honeymoon stay at the Hotel Playa Mazatlan. From one unforgettable moment to the next, we’re here to make sure that your honeymoon package is perfect, from spectacular sunsets and moonlight walks on the miles of sandy beaches outside your beachfront window, to deluxe spa services and personalized attention from our expert concierge staff. Hotel Playa Mazatlan aware that this day so memorable for you deserves special attention, has prepared the Romance Wedding Package considering all the details to ensure your event be unique and unforgettable. Wedding venue or beach front terrace. Open Bar with national e international drinks for 5 hours. Legal paperwork handling judge and marriage licence. Discounts in tours and spa services. Ocean View Room for three nights. Upgraded to a Deluxe Room. A bottle of the house champagne for the wedding night. Relaxing massage session for groom and bride. Make the Event of Your Life Happen! * Requires a minimum of 50 guests in the hotel and a minimum of 25 rooms All Inclusive three nights stay. Available until December 2019. ** Package is subject to availability and space. 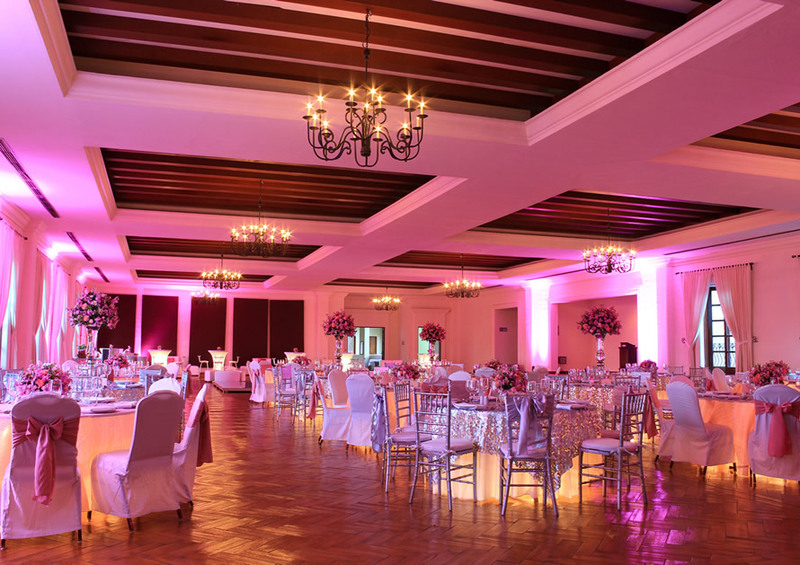 From a small and intimate wedding, to a grand luxurious affair, Hotel playa Mazatlan has a room, venue and design that will surpass even the biggest of wedding needs; let the bride and groom to-be have their dreams come true on their wedding day. Imagine a wedding day celebrated in our palatial. Reflecting Mexico’s opulent, 19th- century haciendas, our 1,850 sq. foot hall is a perfect venue for wedding receptions, galas, small conventions, and banquets. Located in the south wing, adjacent to the Gaviotas room above the gift shop promenade with a Baroque colonial ambiance, French-styled windows, petite balconies, an expansive open-air terraza, commercial kitchen, full bar, restrooms, specialized high intensity lighting and a state of the art audiovisual system, El Dorado sure to make this venue the luxury experience you have hoped and dreamed for. Imagine a wedding day celebrated in our palatial 6,200 sq. foot hall reminiscent of “Mexican European” designed interiors –an unforgettable setting for your large scale convention, event performance, and wedding day reception. Let the bride to-be’ dreams come true in this rich colonial-Mazatlan inspired hall, featuring parquet ballroom floors, chandeliers, crown molding, and stately French windows with wrought-iron balconies –all overlooking the luscious gardens, pools and Colonial style fountain. This hall features a raised stage, high intensity indirect and direct lighting, and a state of the art audiovisual system with an open-air foyer, two large entrances and a private elevator, with an attached commercial grade kitchen, full bar and restrooms. If large, palatial and unforgettable is what you are looking for on your wedding day, the bride and groom are sure to provide an unforgettable experience to themselves and their family and friends that will be talked about for years to come. 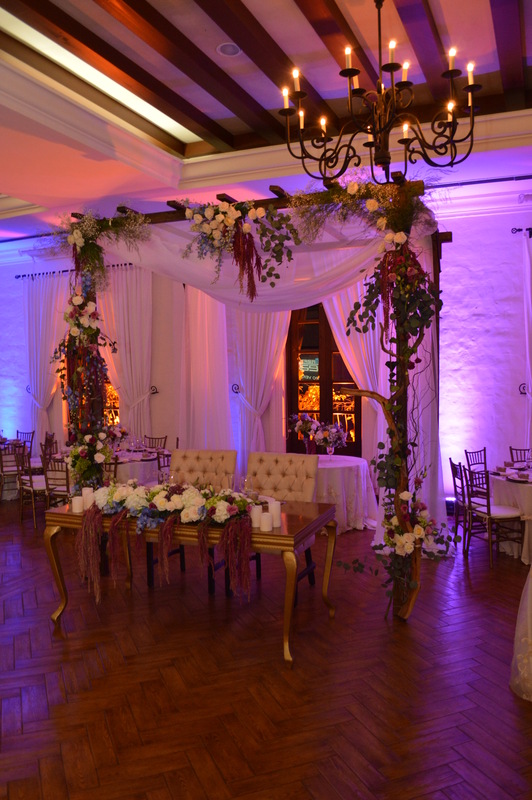 Come visit and celebrate at our Gaviotas hall located in the South wing above our gift shops. Come and celebrate a traditional open-air beach front wedding; featuring sweeping ocean views, unforgettable sunsets, and a one of a kind view of the iconic offshore islands and bird reserve. This hall is perfectly suited and designed for a medium sized wedding, meeting, classes and/or gathering. 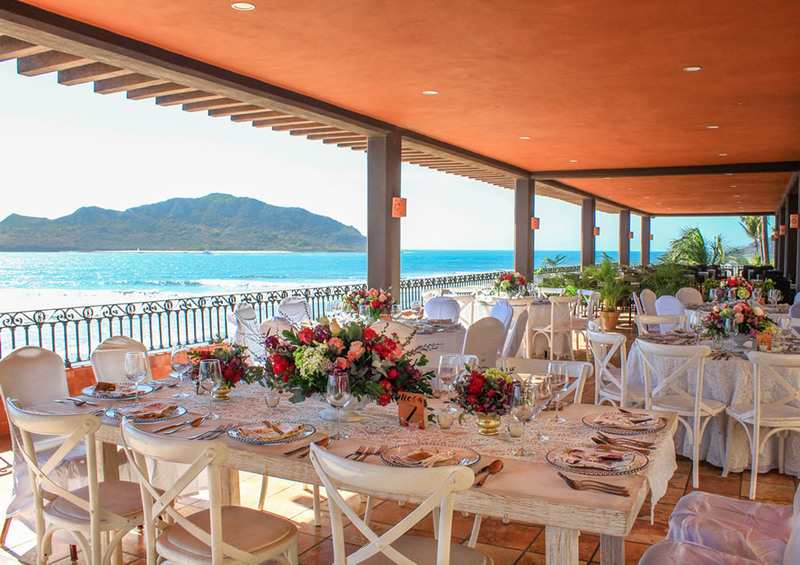 Designed in a Spanish-Colonial style with terracotta tile floors, wrought iron balcony and overlooking the beach, the Veranda hall’ second level location will offer a unique and private feel while still taking advantage of Mazatlan’ beautiful views and weather. 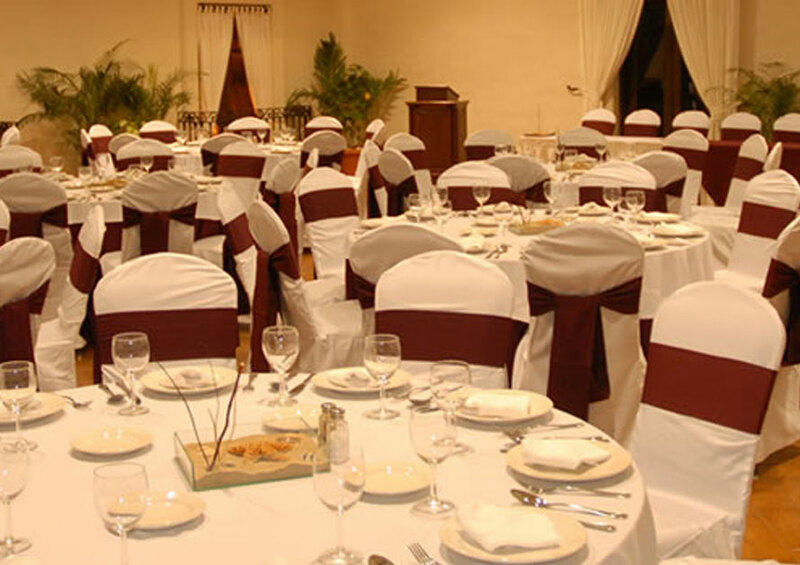 Hotel Playa Mazatlan offer discounts on room and board of up to 40% for your guest when planning a professionally catered wedding or banquet group; depending on the group size and the season in which your event is catered. Don’t hesitate to give us a call directly, speak to our wedding planner, event catering team and/or sales team to help in pinpointing the right group rates for your special event. Many thanks for helping to make such a memorable occasion. The Playa staff is absolutely the best! After spending many vacations with my family at the Hotel Playa Mazatlan I couldn’t imagine having my wedding anywhere else. Thank you for being such a wonderful part of our daughter’s wedding. The Hotel Playa Mazatlan was fabulous. The room looked beautiful and was just what the kids wanted. 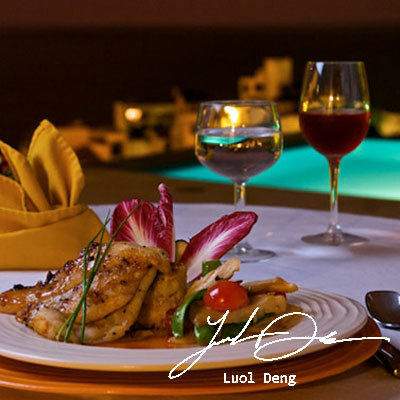 The service and food exceded our expectations. I can recommend the Playa with confidence. Thanks again for all your smiles and help. It was a little nerve wracking to think about planning such an important event from so far away. But Marlene is an absolute pro at everything she does. She perfectly fit our wants and needs. Every little girl dreams about her wedding day and with the help of Hotel Playa Mazatlan, our wedding was more beautiful, more romantic and more perfect than I had imagined. When my father heard we had 400 RSVPs for an event originally planned for 200, he sort of freaked out. However, Marlene calmly said, “We can handle it!” And handle it she did. The service was wonderful, the facility was great, and the food was delicious. My friends and family still marvel at how smoothly the day’s events went. Thank you Marlene for being such a calm and patient consultant. You made our day even more special. Looking forward to seeing you on our first anniversary! Two adult witnesses required, If no friends or family are present, Hotel Playa will provide witnesses.